If President Trump is trying to hurt Nordstrom, it appears he's failed. The company's stock price has climbed more than 7% since Trump lashed out at the company on Twitter Wednesday morning. 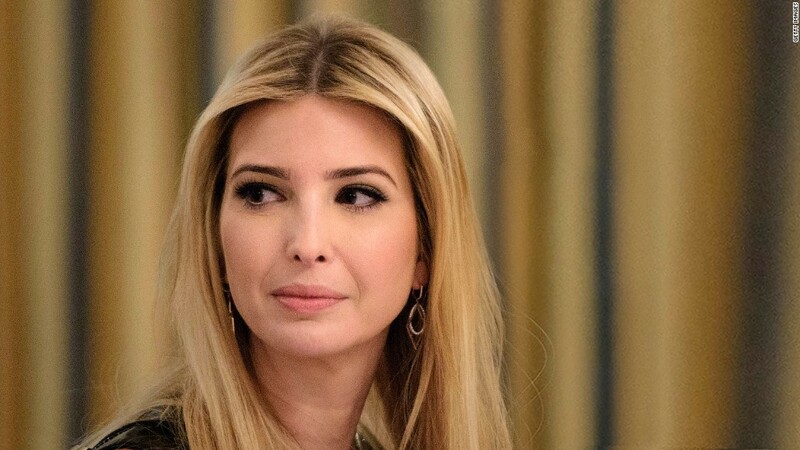 The president claimed his daughter, Ivanka, "has been treated so unfairly" by Nordstrom (JWN) because the company decided last week to stop carrying clothes and accessories from her fashion label. The company has said it parted ways with the Ivanka Trump brand due to declining sales. After the Twitter blast, Nordstrom stock dipped slightly before it began climbing -- and Thursday it reached its highest point so far this month. The company's stock price surpassed the $46 mark Thursday and ended the day at $45.55 per share. Just before Trump posted his Twitter attack, Nordstrom's stock price was at $42.65. The boost has helped Nordstrom's stock nearly recover all the losses its taken since the beginning of the year. It's a welcome boost for the retailer, considering Nordstrom -- like many brick-and-mortar retailers -- has been struggling against e-commerce giants like Amazon (AMZN). Despite the surge and an August earnings report that beat Wall Street's expectations, its stock is still down more than 9% over the last 12 months. Eric Schiffer, CEO of the Patriarch Organization and Reputation Management Consultants, said Nordstrom's decision to abandon a Trump brand could in fact boost its sales. "The fact that they have cut ties with Ivanka will certainly inspire many of their female shoppers who are turned off by her advising someone they feel is taking them back to the 15th Century," Schiffer said. Trump supporters aren't Nordstrom's typical clientele -- so their boycott threats won't likely have a big impact, Schiffer said. But he added that Trump could squash the company if he chooses. 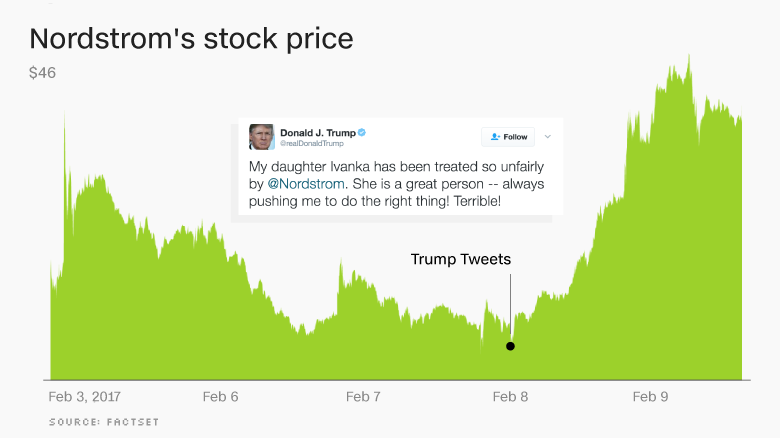 Trump's Twitter attack trigged a rally for Nordstrom stock. "I don't think that this whole Trump effect is over with," Schiffer said. "The fact that [Nordstrom's] stock is ramping does not mean that Trump no longer has the ability to create a brand bloodbath. If he wanted to focus in on Nordstrom, he could make their brains fall out." Schiffer said he doesn't believe that's likely to happen. Ethics concerns abound surrounding Trump's tweet and the recent comments from his senior adviser Kellyanne Conway. She appeared on Fox News Thursday and delivered a promotional plug for the Ivanka Trump brand. Schiffer suspects the outrage surrounding those moves will prompt Trump to back off. Ivanka Trump is on a leave of absence from her company while she serves as one of her father's top White House advisers.